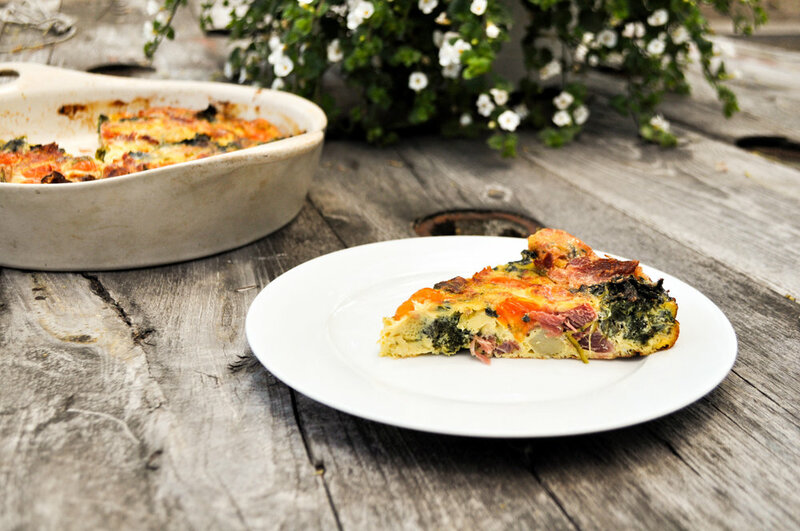 If you’re unfamiliar, a frittata is basically a quiche without a crust. It’s filling enough to count as a meal on its own when thrown into a lunch bag and flexible enough to hold whatever vegetables are on hand. You want long, slow, moist heat to cook a hock, so your preferred tools will be a stew pot or a crock pot. A pressure cooker is great if you have one. It’ll be ready when the meat falls off the bone and your whole house smells amazing. Remove the hock from its cooking liquid, and let it cool until it’s OK to handle. Saute the scallions and garlic in butter until they wilt, and add them along with the steamed potatoes to the bottom of a casserole dish, then add a layer of chopped ham from the hock. Chard is the reigning favorite sauteing green at our house, but you can use any green you like. Rinse the chard in tap water, and leave some water still clinging to the leaves–the moisture will help steam the chard in the pan. Saute the chard, and set it aside. When it is cool enough to handle, take it in your hands and squeeze out as much moisture as you can. Chop the mass of greens into chunks about the size of the cubed potatoes. Lay the chopped greens into the baking dish as well. Whisk the eggs, salt, water, and spices in a medium bowl. Top the potatoes and ham with the egg mixture, and scatter the top of the dish with with whole cherry tomatoes and Parmesan. Bake for 50 minutes or so, uncovered. You can also read this recipe online in our monthly Eat Like a Farmer column in the Petoskey News-Review.